A playful sound and light immersive work that tells the story of an iceberg and bring winter on the Garment District pedestrian plazas on Broadway from West 37th to West 38th Streets. 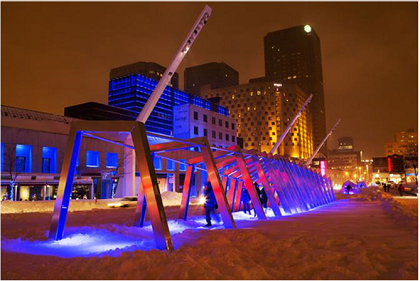 Created by Montréal-based ATOMIC 3, the art installation was coproduced by Quartier des Spectacles Partnership. Access to Iceberg is free and open to the public.